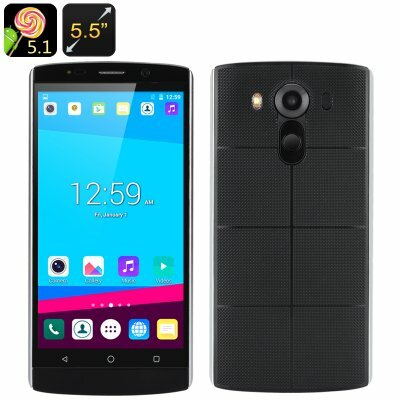 Successfully Added 5.5 Inch Android Smartphone - Android 5.1, Quad Core CPU, Smart Wake, 3000mAh Battery (Black) to your Shopping Cart. Great connectivity, large 5.5 inch screen for great web surfing, Quad Core performance and a day's worth of usage all from under $50, bargain! Looking for a quality budget phone for the children, your parents or as a holiday phone, well look no further, available for less than a fancy dinner this large screen Smartphone packs in all the essentials and a few added extras for an amazing price. Sporting a large 5.5 Inch display means this Smartphone falls into the phablet category and offers plenty of room for browsing web pages, viewing movies and navigating menus all in good definition and bright crisp colors. A Smartphone with a difference the first thing you notice about the V10 is there are no buttons around the side. The power and volume buttons are actually located below the rear camera which may sound a little odd until you hold this 5.5 inch Smartphone in your hand and realize how easy it is to use. With programmable smart wake entry you can program the phone to open a desired app when drawing one of several preset characters on the locked screen, a real time saver and great for navigating between frequently used apps. Running on the reliable Android 5.1 OS this unlocked Smartphone has great network support across 2G: GSM 850/900/1800/1900/2100MHz and 3G: WCDMA 850/1900/2100MHz frequencies. This will let you enjoy wide cellular network support with strong connectivity. Coming unlocked you're not tied to any networks with this Smartphone so can find the best SIM contract for your needs. The efficient Android 5.1 OS is well supported with a Quad Core CPU and having 8GB of onboard memory is no restriction as with a 64GB micro SD card slot you can easily expand the phone storage. Front and rear cameras offer high interpolated resolution shots and with 720P video recording you can capture HD recordings for sharing online. a 3000mAh is plenty of power to keep you phone working all day and brings 12 hours of talk time or as much as 200 hours in standby. This large screen Android phablet comes with a 12 months warranty, brought to you by the leader in electronic devices as well as wholesale large screen smartphones..